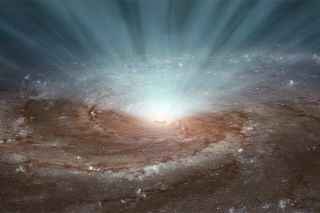 An artist's impression of a quasar in the core of a massive galaxy. Supermassive black holes are the most extreme objects in the known universe, with masses millions or even billions of times the mass of our sun. Now astronomers have been able to study one of these behemoths inside a strange, distant quasar and they've made an astonishing discovery — it's spinning one-third the speed of light. Studying a supermassive black hole some 3.5 billion light-years away is no easy feat, but this isn't a regular object: it's a quasar that shows quasi-periodic brightening events every 12 years or so — a fact that has helped astronomers reveal its extreme nature. Quasars are extremely bright accretion disks in galactic cores driven by copious quantities of matter falling into the central supermassive black hole. The vast majority of galaxies are thought to contain supermassive black holes, though modern galaxies have calmed down and quasars no longer shine. But it's a different story for galaxies that are billions of light-years away. The object at the center of the strange quasar called OJ287 "weighs in" at 18 billion solar masses and is one of the biggest supermassive (or ultramassive?) black holes in the known universe. Interestingly, it is also one of the most well-studied quasars as it is located very close to the apparent path of the sun's motion across the sky as seen from Earth — a region where historic searches for asteroids and comets are regularly carried out. Therefore, astronomers have over 100 years of serendipitous brightness data for OJ287, allowing them to predict when the next flaring event would be. On closer inspection of the flaring events that occurred in recent decades, astronomers realized that rather than a single brightening event occurring every 12 years, the brightening is actually a double peak, providing a clue as to what might be causing it. Mauri Valtonen of University of Turku, Finland, and his international team used several optical telescopes around the world in conjunction with NASA's SWIFT X-ray space telescope to realize that these 12-year double-brightening events are triggered by a smaller black hole in orbit around OJ287. Valtonen is the lead author of the study published in the Astrophysical Journal. An illustration of the binary black hole system in OJ287. The predictions of the model are verified by observations. This periodic close encounter stirs up the supermassive black hole's accretion disk material, rapidly heating it twice in rapid succession. This is what causes OJ287's strange brightenings every 12 years. With this binary black hole model in mind, the researchers were able to predict when the latest event was due to occur. The last brightening happened on Nov. 18, 2015, only a few days before Valtonen's prediction, confirming his team's binary black hole model. But through these observations, the supermassive black hole's spin could also be calculated and it's fast. The team's observations show that it is spinning at a third of the speed of light. Interestingly, from the historical data of OJ287, the team was also able to calculate how much energy is being lost from the system via gravitational waves. Of course, gravitational waves are currently a very hot topic, having been directly detected for the first time by the US-based Laser Interferometer Gravitational-wave Observatory (LIGO) and announced last month. That LIGO detection was the signature produced by 2 orbiting and merging black holes, a discovery that not only confirmed one of Einstein's final predictions of general relativity, but also directly confirmed the existence of 2 black holes merging as one. Though the gravitational waves of the OJ287 black hole binary are too weak to be detected by the current generation of gravitational wave detectors (as the source is far too distant), the Nov. 18 brightening of the quasar serves as a fitting celebration for Einstein's theory that he presented almost exactly 100 years before on Nov. 25, 1915.